Antarctica is the coldest, most desolate place on Earth, and the Southern Ocean that surrounds it is much the same...with one pretty massive exception. The hydrothermal vents on the ocean floor are hot, dark oases, full of previously unknown species. The East Scotia Ridge is located right at the bottom of the Southern Ocean, and it's home to tons of thermal vents, including the super-hot black smokers that can reach well over 700 degrees Fahrenheit. Though almost no sunlight reaches the areas around these vents, the vents are constantly spewing out heat and a particular brew of chemicals that can sustain some very specifically adapted organisms. "Hydrothermal vents are home to animals found nowhere else on the planet that get their energy not from the Sun but from breaking down chemicals, such as hydrogen sulphide. The first survey of these particular vents, in the Southern Ocean near Antarctica, has revealed a hot, dark, 'lost world' in which whole communities of previously unknown marine organisms thrive." The Antarctic vents seem to be dominated by this new crab species, a type of yeti crab. Huge colonies of this crustacean surround all the vents of the Southern Ocean, as you can see in the image on the left. The survey team's craft, the rather aptly named Remotely Operated Vehicle (ROV), also saw a predatory starfish with seven arms crawling across a field of barnacles - as you might guess, we've never seen anything like that before. 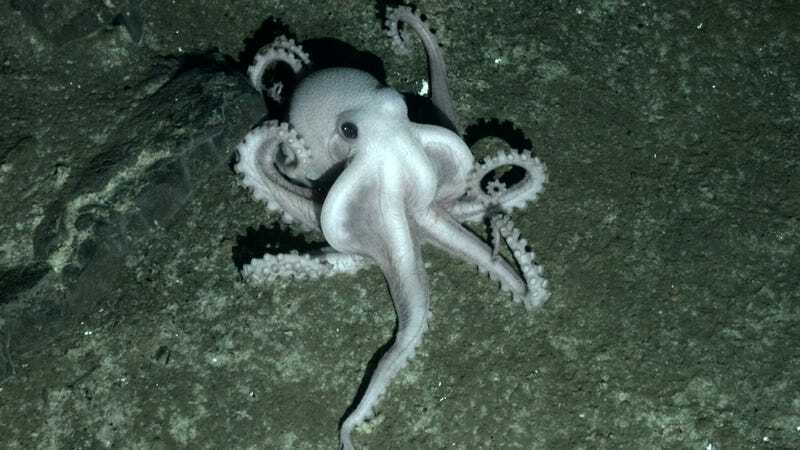 There was also a glimpse of a mysterious pale octopus on the seafloor, which might well be the representative of a new species. The vent ecosystems of the Southern Ocean are almost nothing like the vents found in the Pacific, Atlantic, and Indian Oceans. Those other, previously explored vents are full of tubeworms, vent mussels, vent crabs, and vent shrimps, and none of those species had any presence at all in the waters around Antarctica. That suggests the Southern Ocean represents a sort of boundary line between different vent systems. Even more excitingly, it suggests thermal vents are capable of far more biological diversity and complexity than we had previously imagined possible. Via PLoS Biology. Images courtesy of Oxford University.